Giselle Kennedy Lord lives in Hood River, OR, and is currently a MLA candidate in Gastronomy at Boston University. She owns and operates a small, food-focused business called Quincho and is an enthusiastic supporter and weekly customer of her local farmers markets. June Husted qualifies for and uses Veggie RX (medical doctors “prescribe” this for patients). 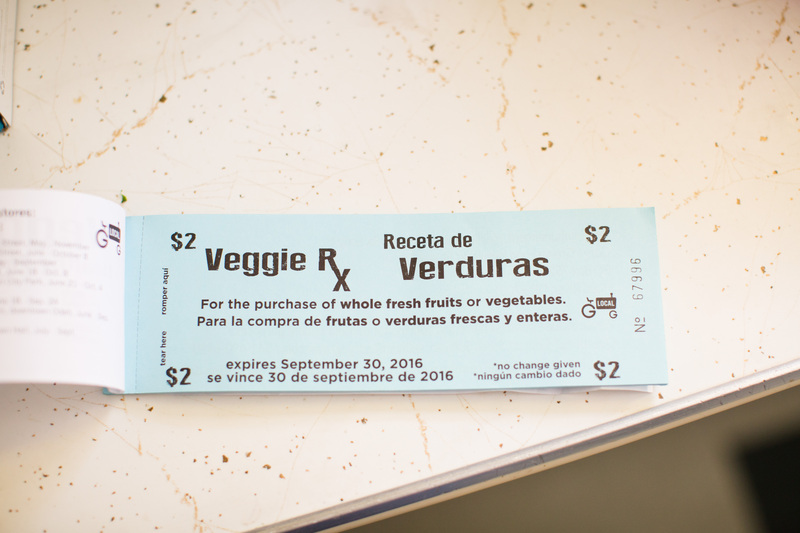 With vouchers, Veggie RX folks recieve free vegetables from places like farmers markets. Copyright 2016 Josh Kohanek. Courtesy of the Robert Wood Johnson Foundation. An apple a day to keep the doctor away is so much more complicated than it sounds. For the food insecure, it can be viewed as a marker of access, social status, and even luxury. But for participants of the Veggie Rx program, it can be a symbol of better health, stronger bonds, and a more promising future. Veggie Rx was started in Oregon by the non-profit Gorge Grown Food Network in response to a study (2) that identified food insecurity in 34% of households in the five counties that make up the Columbia River Gorge, one of the nation’s top tourism destinations and home to a lush valley that produces huge volumes of fruit and other agricultural products. The aim of Oregon’s Veggie Rx is to increase access to fruits and vegetables for people who have been identified as food insecure. When a patient at one of Gorge Grown Food Network’s 28 distribution partners (medical facilities and social service institutions) in the Columbia River Gorge answers yes to one or both of two questions aimed at measuring food security – asking patients if they have worried about running out of food or have actually run out of food before being able to get more within the last 12 months – they are enrolled in the program and given a monthly “prescription” of $30 in vouchers that can be used at farmer’s markets and grocery stores exclusively for fruits and vegetables. Copyright 2016 Josh Kohanek. Courtesy of the Robert Wood Johnson Foundation. The intersection of healthcare and the food system is where Veggie Rx found its bedrock. Dr. Alan Graham M.D. of Arizona describes the current healthcare system as more of a “sick- care system,” focused on treating people after identifying a health issue instead of finding ways to make the general population as healthy as possible. And then there’s America’s food system, which is tied to assistance programs and policies that focus on quantity rather than quality, on survival instead of health. Though the Veggie Rx program has been hugely successfully in terms of increasing access to fresh produce for food insecure individuals and families, Sullivan says the greatest impact of bringing the Veggie Rx program to fruition last year was elevating the conversation around food insecurity to a conversation that identifies hunger as a health issue. Oregonians refer to the area simply as The Gorge. 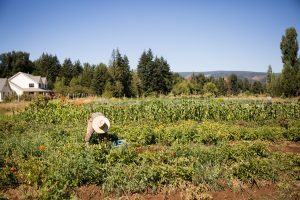 The Gorge is not a place that is commonly associated with poverty or food insecurity, so the findings of that study were surprising to many, locals included. Widespread food insecurity and invisible poverty are two components of a very complex problem with no single solution. These issues can be easily linked to the major health crises Americans currently face as a country. 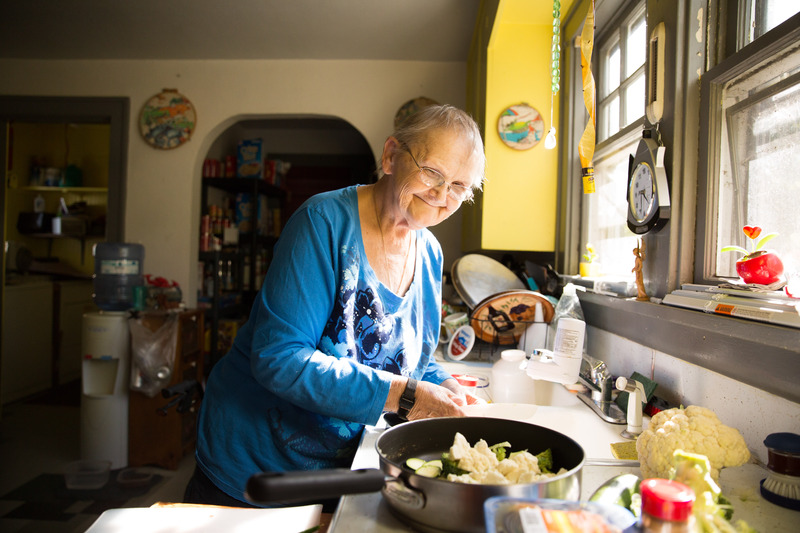 Chronic health conditions are often symptomatic of food insecurity. But programs like Veggie Rx reflect an opinion shared by health professionals and social advocates. They agree that primary care and medical institutions can be part of the response to food insecurity, and that achieving food security can be part of the solution to overall health. One Community Health, a local medical clinic that serves low-income patients, was quick to sign on to the program and is now one of the first in the country to fund their own vouchers, which Sullivan describes as revolutionary. Dr. Natalie Speck M.D., a physician at One Community Health, has been writing veggie prescriptions for about a year and has seen the benefits of the program first-hand. One of her patients began engaging with a diabetic educator at the clinic after escaping the grasp of a severely abusive husband (now incarcerated ex-husband). She and her three young children were quickly enrolled in the Veggie Rx program and, after eliminating nearly all processed foods from their diet, have seen significant health benefits like weight loss and increased activity and energy. But Speck says that “the impact has gone far beyond the simple act of eating, allowing them to form closer bonds and move past their trauma, with a focus on their health through food. This example truly represents the “food as medicine” concept,” a concept that Speck calls hugely important in the prevention of deadly health conditions. So you can see how that apple quickly becomes so much more than a healthy daily snack. In an effort to stretch their dollars to cover three meals a day, people are forced to buy processed and government subsidized foods simply because they’re cheaper. Incorporating more fruits and vegetables into a household’s foodways may seem like the independent choice of individuals and families, but often it’s not. Eating well is expensive, and huge majorities of people are suffering from chronic, diet-related conditions as a result of the economics of eating. Connecting hunger to obesity and diabetes can seem counterintuitive, but it’s a very real connection. It’s easy to write people off as willingly unhealthy and to assign all of the culpability to the individual, instead of looking at factors outside of their control – namely economics, food systems, and food justice. The Columbia Gorge is the largest exporter of pears in the United States and its landscape is riddled with myriad fruit orchards, ranches, vineyards, processing facilities, and cold storage. Yet 90% of that food is exported and an equal amount of food is imported at a premium, leaving a significant portion of the population without access to the produce grown, quite literally, in their backyards. Another of Dr. Speck’s patients, a 55-year-old diabetic man who has lived and worked on the same local apple orchard for 30 years, continually relies on cheap commodities as the mainstay of his diet for lack of time and so that there is enough of his paycheck left over to support his family. His co-workers do the same. Many people living in this apparently affluent and undeniably beautiful corner of the Pacific Northwest are consuming foods they’d prefer to replace with more healthy, wholesome options as a consequence of their financial constraints. But the results of that system are medical. Many members of the medical community do or can agree that chronic health conditions are direct consequences of poor diet, and poor diet is a direct consequence of food insecurity, which makes programs like Veggie Rx seem like a very reasonable and logical response to the issue. It’s wonderful that so many people and families are making good use of the program and seeing big changes in their diet and overall well-being, but perhaps the greatest impact is the redirection of our national perspective about why we have these problems in the first place. Government subsidies make it such that the healthiest products are the most expensive. Topics like nutrition, diet, food preparation, and overall health are not part of our standardized education systems. We’ve come a long way from the ‘let food be thy medicine’ mantra to a place where medicine is the method by which we excuse or cancel out our bad behavior. We have subjected our environment to significant changes that impact and alter the feasibility of agricultural production and access to agricultural products. Veggie Rx and programs like it are clearly not the single solution to our dietary or food security issues because, again, there is no single solution. But it’s a step in the right direction, as much because of how it increases access to fruits and vegetables for the people that need it most as the way in which it is changing, or maybe just beginning, the conversation around food insecurity and how it relates to health. If we can successfully bring the issue of food insecurity and the importance of healthy diets into the medical arena, an arena that is arguably taken more seriously than our home kitchens and grocery stores, perhaps we might find the multi-faceted solutions to our nation’s health crises and systematic shortcomings. Veggie Prescription programs are a good start. But they are just one part of the solution, and still these programs are at much at risk as the people they support. The Veggie Rx program is not government funded and is currently seeking commitments for long-term funding, so the continuation of the program stands on shaky ground. Three participating medical facilities as well as the Columbia Gorge Health Council and Tofurky (whose headquarters are in Hood River) funded the first year of Veggie Rx in the Gorge. There is also worrisome lack of awareness of the programs and the issues they address. With the exception of Dr. Speck, none of the doctors I spoke to had heard of the program despite living in states where it is being used. The futures of Veggie Rx and similar programs remain to be seen, but they indicate a need for a new conversation and new systems to combat very significant issues of our day. The Columbia Gorge region was recently awarded the 2016 Robert Wood Johnson Foundation Culture of Health Prize. The foundation commends “the spirit of collaboration” with which the diverse members of the region’s Community Care Organization (CCO) approach discussions and design solutions to assess and improve the well being of its community members. They award points to five regional programs borne of the CCO’s assessments and Veggie Rx is the first one on that list, but their descriptions of each program show that improving health requires profound collaboration, cross-organizational integration, truly representative voices, and sustainable policies. The write-up on the foundation’s website recognizes Veggie Rx and the other highly impactful programs for their inclusiveness and effectiveness. The many people involved in these programs have started a new conversation about health and successfully implemented new systems that directly respond to the unique needs of the community. While it’s just a start to solving complex issues around hunger in America, their success gives us reason to be hopeful about the future, and the prospect of veggies and justice for all. (1) Giselle Lord Kennedy is an MLA candidate in Gastronomy at Boston University and a small business owner in the Columbia Gorge.